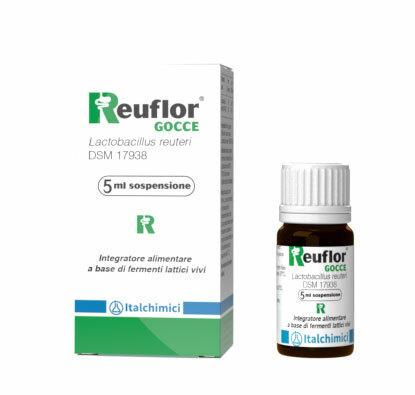 Reuflor drops is a food supplement containing the patented lactic acid bacterium Lactobacillus reuteri Protectis (L. reuteri DSM 17938) that helps the good microorganisms restore a natural balance in the gut. Shake well for 10 seconds before each use to mix the bacteria culture with the oil. To dispense the drops press the tube gentle and give by spoon. Do not administer directly from the tube into the mouth or add to hot drink or food as this may damage the live bacteria. Storage: Store in a dry place, not above room temperature (max 25 °C / 77 °F). Keep out of reach of children. Keep the container closed and make sure the cap is properly tightened. Some excess oil may accumulate in the cap. If this happens, wipe off with a clean, dry cloth. Avoid contact with fluids like saliva or water. Opened container should be used within 3 months. Sunflower oil, medium chain triglyceride oil (palm kernel) and L. reuteri DSM 17938. The package includes a white desiccant device for prolongation of shelf-life. The desiccant device is approved for use in direct contact with food and should not be consumed. The product is packed in a protective atmosphere. 5 drops once daily. One dose consists of a minimum of 100 million live L. reuteri Protectis. Recommended dose should not be exceeded. This product should not be used as a substitute for a varied diet. Can BioGaia’s products be stored in room temperature? BioGaia products comes in different versions, we therefore recommend you to follow the instructions on the package. However, if room temperature is above 25°C/77°F we always recommend storage in the fridge. Can BioGaia Protectis drops be stored in the freezer? BioGaia Protectis bady drops should not be stored in the freezer, as this will significantly shorten the shelf-life of the product. How should BioGaia Protectis drops be stored? BioGaia Protectis drops comes in two different versions, we therefore recommend you to follow the instructions on the package. However, if room temperature is above 25°C/77°F we always recommend storage in the fridge. Why does BioGaia Protectis drops come in a new delivery system? In BioGaia we are constantly working on improving our products. The Easydropper is a new delivery system for probiotic products. It has an improved drop function which facilitates the administration of the product​ and less environmental impact compared to glass bottles. What are the brownish dots that sometimes appear on the surface of BioGaia Protectis tablets? The spots are not dangerous and the product can still be used. BioGaia Protectis tablets contains ascorbic acid, which is an antioxidant that contributes to the stability of the tablets. Over time the ascorbic acid oxidizes and the color becomes darker. This darkening is seen as small “spots” on the tablet. Are multi-strain products better than single-strain probiotic products? • The probiotic product must have been tested in human clinical studies, with the same dose and with the same bacterial strain(s) as in the commercial product. Lactobacillus reuteri (L. reuteri) is a probiotic bacteria that has co-evolved with humans since the beginning of time, and because of that it is adapted to its host. L. reuteri is among the first bacterial species to naturally become established in the microbiota of the newborn. BioGaia probiotic products with L. reuteri are among the most scientifically well-documented probiotics in the world with regard to both efficacy and safety. To date 202 clinical studies with BioGaia’s L. reuteri-strains have been performed in more than 17,200 people of all ages. Positive results have been shown for several gastrointestinal disorders and oral health. Results have been published in 180 articles in scientific journals (February 2019). Read more about Lactobacillus reuteri. What company has the distribution rights for BioGaia’s products where I live? Please go to Distribution network or Our products for more information. Can I still use BioGaia Protectis drops or tabs if they have been exposed to temperatures over 25 °C / 77 °F? Exposure to high temperatures and/or high humidity will significantly shorten the shelf-life of the product. However, the product will still be safe to use. From what age can Lactobacillus reuteri Protectis drops be used? Clinical studies have shown that BioGaia Protectis drops are safe to give from day of birth.